R-Comp Interactive's ARMini is a modern, British-built desktop PC designed to run the ARM chip's original operating system, RISC OS. 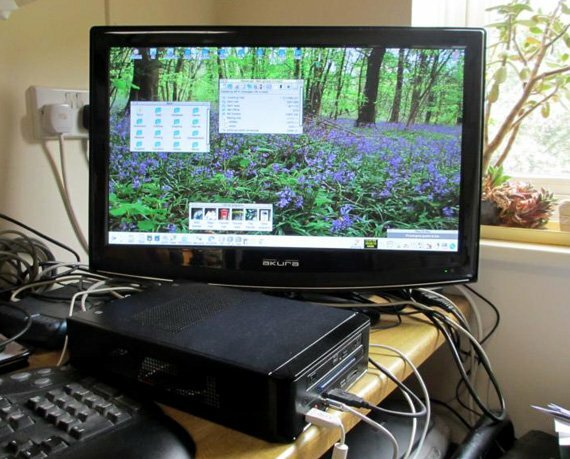 It isn't a completely new machine; rather, it's a custom bundle of a Beagleboard and various bits of supporting hardware inside a mini-ITX case, together with a customised build of RISC OS. The aim is to provide a smooth experience to existing RISC OS users. At £599, the ARMini is more expensive than the basic model of the considerably smaller and more powerful Apple Mac mini – and you don't get a lot of hardware for your money. The case is slightly larger than an external 5.25in drive, and alongside a lot of empty space, there's the tiny 3in square motherboard, an HDMI-to-DVI adaptor, a USB hub and an 8GB thumbdrive. A slimline internal DVD-RW drive is now included for no extra cost, although our review unit was the earlier model that lacked one. There's also 14cm-long external power brick. The main board is the higher-spec Beagleboard-xM – 1GHz Cortex-A8 CPU, 512MB Ram, on-board Ethernet – running the shared-source RISC OS 5. Together, the storage and Ram provided aren't much in 2012, but then, by modern standards RISC OS is not merely tiny but minute, as are its apps. Even with a suite of freeware and some demo files, only about 750MB of the thumbdrive was occupied. 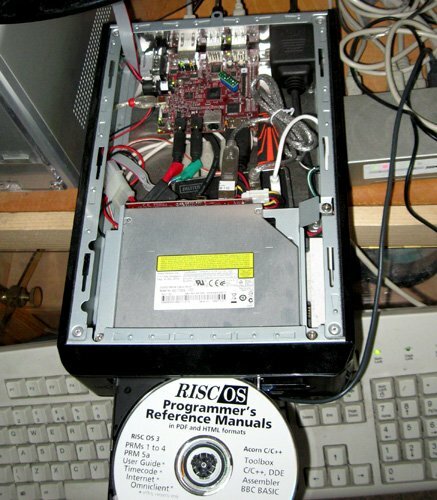 RISC OS itself lives on a micro-SD card in a slot on the Beagleboard. It's not a lot just shy of £600, but what you're paying for is integration. The review unit came preloaded with RISC OS 5.17 from RISC OS Open Ltd, the company behind the freeware shared-source version, but R-Comp offers a free download that upgrades the machine painlessly to 5.18, together with updates for the bundled apps. I also tried an upgrade to the experimental 5.19 and it worked flawlessly. The ARMini includes licences from both Castle – owner of RISC OS 5, the shared-source fork – and RISC OS Ltd, vendor of RISC OS 6, the proprietary commercial version. Although you're not running the commercial RO6, R-Comp's build of RO5 includes some enhancements taken from it – so, for instance, when you change screen mode, a confirmation dialog box appears and the machine times-out and automatically reverts goes back if you don't click one. This is a handy addition – RISC OS's screen-mode support is a bit palaeolithic. It can't read your monitor's capabilities over EDID and the Beagleboard's GPU is working at the outer limit of its abilities driving a big modern flatscreen, so invalid mode settings and an unusable display are a real risk. Indeed, in testing, I found I could only get a display with an HDMI cable – using the DVI port yielded no picture.